Home › Latest News › 10 Year Celebration: Street Party! As all Capetonians know, hosting anything outdoors in September is a risk – one never knows what the weather will get up to. We were very fortunate to have Saturday 30th dawn sunny with no wind. Off to a good start, we began to set up for the day ahead. Blowing up countless balloons with discounts inside, managing not to eat any of the cupcakes as they were laid out on the table, putting up tables and gazebos plus an inflatable airspace man were just some of the items on our agenda. The smell of bacon drove us crazy as the wonderful team from Woody’s Bacon began to fry up pork neck steak, sausages and bacon. The smell of fresh Paninis being unpacked added to the atmosphere and we couldn’t resist – they had a queue before 10am! The Ratrod Cats, an original rockabilly band from Cape Town kept our toes tapping throughout the day with their upbeat tunes and cold beverages were available upstairs at the Tyger Tavern. There were smiles all-round as balloons popped and cupcakes were devoured. Thank you so much to everyone that came to celebrate with us, we really appreciate it! 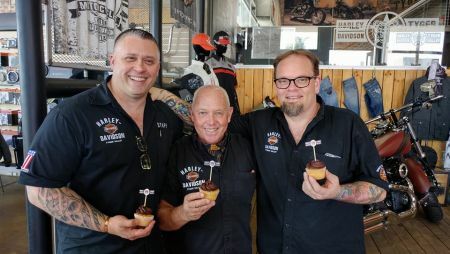 Here’s to another 10 years of friendship, motorcycles, fashion, service and the Harley-Davidson® brand!